Note: This is the bound book only and does not include access to the Enhanced Pearson eText. To order the Enhanced Pearson eText packaged with a bound book, use ISBN 0133830888. Ronald W. Rebore has 22 years of experience as a central office administrator: nine year as the Assistant Superintendent for Business and Finance with the Lindbergh School District; five years as the Superintendent of Schools for the Valley Park School District; and eight years as the Superintendent of Schools for the Special School District of Saint Louis County. He is currently a Professor in the College of Education and Public Service at Saint Louis University. He was the Missouri State President of the Association of School Business Officials in addition to serving on various committees of the Association of School Business Officials International. He has also served as an evaluator for the North Central Association of Colleges and Secondary Schools. During his professional career, Professor Rebore has conducted numerous workshops and seminars on educational leadership and has served as a consultant to many school districts. He received a Bachelor of Arts Degree in philosophy, a Master of Education Degree in counseling and guidance, and a Doctor of Philosophy Degree in educational leadership from Saint Louis University. Ronald Rebore’s 46 publications include twelve books. Two of the books have been published in multiple editions. 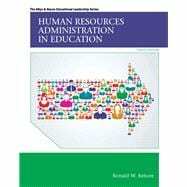 Human Resources Administration has ten editions and two of his books have been translated into Chinese. Over the years, his research has become focused on the human rather than the technical dimensions of educational leadership.